Bishop Gerald F. Kicanas Feb. 11 urged Congress to work for immigration reform but not through the path it is currently seeking with increased border enforcement, tougher criteria for immigrant families seeking asylum and a quicker return of immigrant children to their homelands. 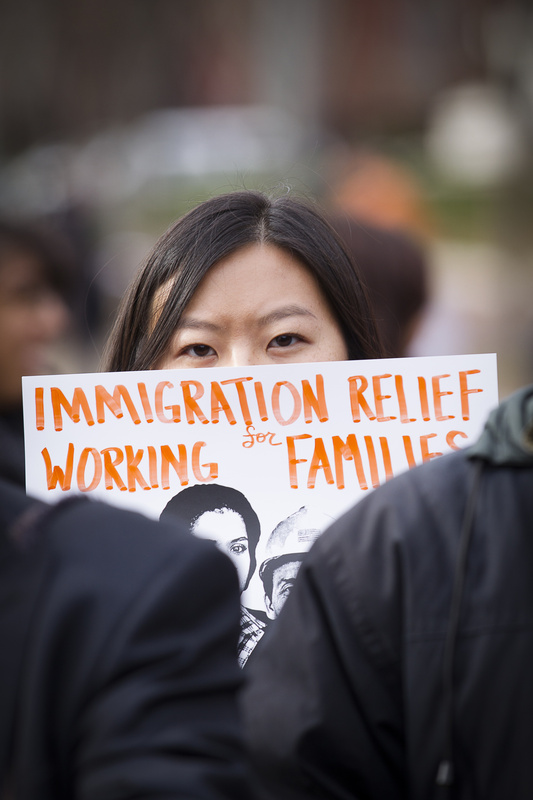 "These bills would not fix our immigration system. Rather, they would make it less just and would undermine our moral authority domestically and globally," said the bishop, who heads the Diocese of Tucson, Arizona. He spoke at a hearing on immigration enforcement held by the Immigration and Border Security Subcommittee of the House Judiciary Committee. The bishop, one of four witnesses at the hearing, was the only one who spoke against the proposed immigration enforcement bills. The witnesses supporting the measures were a North Carolina sheriff who said law enforcement agencies need more direction in enforcing immigration laws; an immigration reform group official who argued that immigrants are taking away American jobs; and a senior fellow at the Center for Immigration Studies who said that the U.S.-Mexico border has become a "de facto go-free zone" where those who cross face no "consequence for their action." Bishop Kicanas, in his lone opposition to these bills, said they would "adversely impact immigrant and refugee children, perhaps the most vulnerable population impacted by our nation's immigration laws." An aspect of the proposed legislation would repeal the Deferred Action for Childhood Arrivals program, known as DACA, and according to the bishop, would "keep children in detention for long periods of time and would weaken protections for abandoned, neglected, and abused children." He said another proposed legislation, the Secure and Fortify Enforcement Act, or SAFE, would "criminalize" those without documents and those who transport them. Bishop Kicanas also said the proposal to send immigrant children back to the countries they were fleeing would "severely weaken our asylum and refugee protection system" and would "repeal the use of parole in place, thus resulting in more family separation." He reminded the subcommittee's chairman, Rep. Trey Gowdy, R-South Carolina, that this issue has come up before, in 2005 with the House passage of the Border Protection, Antiterrorism and Illegal Immigration Control Act, which sparked protests across the country and failed to pass the Senate. "As a nation, do we want to take the country down this road again? Do we want to criminalize millions of persons who have built equities in this country, jail them, and separate their families, including those with U.S.-citizen children?" he asked. He said the U.S. Conference of Catholic Bishops, members of faith communities and the majority of Americans were "disappointed that comprehensive immigration reform legislation was not passed" by the last Congress and urged it to try again, stating: "We stand ready to work with you toward this goal." When asked by Rep. Zoe Lofgren, D-California, if he thought Pope Francis would bring up U.S. immigration policies in his planned visit to Congress in September, Bishop Kicanas said he most likely would since the issue is "dear to his heart." He said the pope might encourage Congress to "move forward with courage and conviction" on immigration reform that includes enforcement but also looks for ways for families to come to citizenship. Prior to the hearing, the bishop told Catholic News Service he hoped his testimony would help prod Congress to finally begin acting on immigration issues he previously testified about five years ago. "They've been kicking this can down the road for a long time," he said. "And we've not gotten anywhere." He said he fears Congress has forgotten the impact of last summer's widespread attention to the tens of thousands of mostly Central American minors crossing the U.S. border without legal guardians and tens of thousands more families with children also being apprehended. As the surge of vulnerable populations who were fleeing gangs and poverty in Guatemala, Honduras and El Salvador has eased and media attention has gone elsewhere, the bishop worries that Congress will try to frame the problems of immigration around security and ignore the human toll. He said he has visited and celebrated Mass at two of the detention centers where the minors are held. At one, the children are as young as infants and many are between the ages of 7 and 15. "You ask them what it's like in their home countries and the first thing they talk about is the gangs," he said. "They live in fear."